A good state must show equal concern for the interests of all of its citizens irrespective of their race, class, religion, ethnicity, gender, and so on. Citizens obey the laws of their state and pay taxes to it, and in return receive the benefits of citizenship. A state oppresses part of its population when it does not recognize the equality of citizens on some arbitrary basis (e.g. race, religion, class, gender, etc.). No extant state does a perfect job of fulfilling its duty to show equal concern, and in all the developed states there is a wide ranging and fierce debate over what equal concern entails. We often ask one another if our societies are unjust to blacks, women, gays, minority religions, and so on down the line. The United Kingdom is a special kind of state because it is a union. Where once there were four states–an English state, a Welsh state, a Scottish state, and an Irish state–now there is one state, the United Kingdom. England only had to show equal concern for the interests of the English, Wales the Welsh, Scotland the Scottish, and Ireland the Irish. The United Kingdom, by contrast, must show equal concern for the English, the Welsh, the Scottish, and the Irish. In so doing, the UK constructs a larger supervening national identity on top of the old identities–the notion that regardless of whether one is English, Welsh, Scottish, or Irish, one is “British”. A union is instituted to put an end to competition among states, to instead bring them into mutual cooperation. Before the UK existed, England and Scotland were in perennial competition with one another for resources and occasionally fought wars. When England and Scotland would negotiate, England would try to get the English the best deal it could and ignored the interests of the Scots, and Scotland behaved the same with respect to the English. Whichever side had the stronger negotiating position would typically prevail both in diplomacy and in war. Typically, England was stronger. No political entity yet existed which cared about the interests of both the English and the Scots equally, so there was nothing to protect the weaker party from the stronger. In the modern age, we frequently hear the principles of autonomy and self-determination praised. We forget why human being create large political entities–to enlarge the space for cooperation. This necessarily carries a cost with it. In the most autonomous and self-determining world we can imagine, every family unit would constitute an independent state. The level of cooperation we achieve at the family level is not large enough to provide us with the standard of living we desire, so we form larger political units. Human history can be read as a story of state expansion–the family becomes the tribe, the tribe becomes the city-state, the city-state becomes the nation-state, and the nation-state becomes the regional state. Each larger state is capable of achieving far more for its inhabitants than the level below, because larger states can put more resources to cooperative purposes and allow for a wider order that allows for commerce and trade. Regional states are historically rare–since the Roman Empire, there has been perhaps only one true regional state in the western world, the United States. The European Union is an attempt to create a new regional state in Europe, thereby elevating the cooperative potential of Europeans to the same level as that enjoyed by Americans. It is beset by difficulties because the various individual European states continue to operate for the interests of their citizens exclusively rather than for the benefit of Europe as a whole. The EU does not possess a truly federal system like the United States. Instead, the most powerful European states dictate EU policy. This breeds resentment in the weaker states, which acutely (and rightly) feel that the European Union does not show equal concern for their interests. Euroskepticism follows. The United Kingdom is not like the EU, US, or Roman Empire, but like France, Germany, Italy, and Spain, it is an amalgam of lesser states, some of which still maintain fiercely independent cultural identities. France was the first of these nation-states to be created. It found that the cooperative abilities it was afforded through unification allowed it to pursue the interests of the French people far more widely than could Brittany, Normandy, Burgundy, and so on. As a unified state, France was able to expel England from the European continent and invade the Italian city-states. France’s tremendous power gradually, over many centuries, forced other European states to unify so that their citizens could defend their interests on the international stage. The European states came to possess so much power in this way that they began to dominate distant reaches of the globe and forge large empires. It was at this point that they made the greatest mistake of the modern era. When the Europeans took territory in the Americas, Africa, Asia, and Oceania, they could have expanded their unions, extending equal concern to their new populations. They could have granted these peoples citizenship and attempted to treat them the same way they treated their extant citizens in the European core. If they had done so, they would have created truly great and long-lasting states. Instead, the Europeans embraced racist, classist, and ethnocentric ideologies. They subjugated these populations instead of treating them as equal citizens. When the Europeans were weakened as a result of the in-fighting that occurred during the 7 Years War, Napoleonic Wars, and the two World Wars, they no longer had the sheer power necessary to continue to hold these populations subject, and they rebelled and sought independence. Within a couple centuries, the Europeans lost everything. Today, most of the countries in the world are independent because at some point, their citizens rightly realized that the European empire of which they were a part did not recognize them as equals. In the Scottish National Party (SNP)’s literature on independence, it attempts to tie Scotland to the post-colonial states, to suggest that Scotland should become independent because, like all these other states, its interests are not shown equal concern by the United Kingdom. The United Kingdom is by no means a perfect union–it lacks the formal federal structure of the US or Germany. In recent decades, British governments have created ad hoc devolution in fits and starts, but there has been no unitary policy to structure the union as a federal state. Nevertheless, the argument that Scotland is equivalent to British Kenya or even to British America is more than a stretch. Unlike America or Kenya, the Scottish people are full British citizens entitled to the same benefits as English, Welsh, or Irish citizens. Indeed, the Scots are arguably entitled to greater consideration than the English. There is the famed West Lothian question–because Scotland has a regional parliament while England only has the British parliament in London, Scottish members of parliament (MPs) can vote on English matters while English MPs cannot vote on certain Scottish matters. The SNP argues that this ignores part of the story, because Scotland contributes more in revenue per capita than does the rest of Britain, but this claim relies on the assumption that the vast majority of the UK’s oil revenues are considered Scottish. While it is certainly true that most of the oil (about 84%) is closer to Scotland than to the rest of the UK, an independence settlement would necessarily have to be negotiated between Scotland and the rump state that would be the remainder of the UK. What is likely to be the outcome of that negotiation? Well, if Scotland is independent from the UK, then effectively we have same situation that prevailed before the union. Scotland will negotiate with the interest of the Scots in mind and the rump UK will negotiate in the interest of the remaining British. An independent Scotland will have renounced the authority of the UK government and consequently its protection and concern. The rump UK would have a duty to promote the interests of its citizens, and the Scots would no longer be UK citizens. Therefore, we should expect a rump UK to negotiate very hard with Scotland, as if it were a foreign state like China, Russia, or France. Consequently, rump UK would probably get a lot more of the oil than an objective, independent analysis would offer. It would likely push for the oil to be split on the basis of population. Scotland’s population is about 8.3% of the UK total, and 8.3% is a far cry from 84%. Even if the rump UK were to do a straight compromise (unlikely, due to its much larger wealth and power), 40-50% would still leave Scotland worse off in terms of revenue. To make matters worse, North Sea oil revenues are likely to decline in the coming decades, which means that no matter how good a deal the Scots might be able to get, in the long-run they would probably still end up poorer. This is not the only area in which a rump UK would likely cause an independent Scotland trouble. The SNP claims that an independent Scotland will stay on the UK’s currency, the pound. The trouble is that a rump UK would likely have very different monetary policy from the extant UK. As it stands, the UK makes monetary policy with the interests of the whole of Britain in mind. It treats Scottish unemployment or inflation as being of equal importance to unemployment or inflation in other parts of Britain. With an independent Scotland, Scottish figures would no longer be of any concern to the Bank of England. In contrast, in a truly unified country like the United States, the Federal Reserve treats all citizens’ economic interests as equivalent regardless of which US state they live in. As long as Scotland remains part of the UK, it gets the American experience. As soon as it leaves, it will become vulnerable to the same financial plagues currently ravaging Portugal, Spain, Italy, and Greece. An independent Scotland is also likely to lose access to European markets because it will likely not be admitted to the European Union. The SNP denies this, claiming that it is against EU law for the EU to expel extant member states from the EU. But many European states fear that an independent Scotland will bolster their own independence movements (e.g. Catalonia, Brittany, Northern Italy, the Basques, etc.). These states claim that while the UK is part of the EU, an independent Scotland would constitute an entirely new entity and would require uniform approval from the EU’s extant membership to join. Spain and France have vowed to block Scottish EU membership should it become independent. Taken together, these economic impediments will reduce Scotland’s economic growth and depress government revenues. This is particularly troubling because one of the biggest motivators for independence in Scotland is contempt for the ruling Conservative Party’s austerity policies. If independence reduces Scotland’s long-term revenues, it will also reduce Scotland’s long-term capacity for public spending, eventually coercing the Scots into embracing the very austerity policies they presently seek to evade. In the meantime, in the rump UK, the loss of left-leaning Scottish MPs will make it easier for the conservatives to beat labour in close elections, making it easier for the British right to further contract the welfare state. 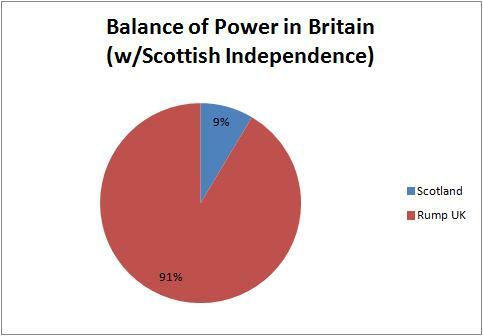 Politically, Scottish independence is counterproductive. For some, this may all be the necessary price of achieving the autonomy and self-determination that comes with independence. But I ask this–is independence so intrinsically desirable that it is worth having even if it makes people demonstrably and substantially worse off? We all agree that making every household an independent state is more trouble than it’s worth. We know, deep down, that we can all live better lives if we work together and agree to be bound by rules and laws that we may not always fully control ourselves. The Scottish people are no subjects, they are free and equal parties to the UK. They benefit as much if not more from the union than the English, Welsh, and Irish. To declare independence anyway for the sake of Scottish patriotism alone would be to condemn future generations of Scots to inferior lives out of foolish pride. Is Scottish independence a bad idea? All valid points. Some people are making decisions based on emotions, not logic, although they may claim the opposite. You only have to drive from London to Edinburgh and then Glasgow, as I have done, to see that Scotland is less wealthy than England. I don’t know why they would choose to slip further behind. Thank you very much. Mercifully for both Scotland and the rest of the UK, it all worked out in the end, but what a close call.